Lifetime Products, Exedy America Corp., Timken Rail Bearing Services Co. Source: Knoxville Area Chamber Partnership, Development Corp. of Knox County, Knoxville-Knox County Metropolitan Planning Commission Industrial Space Inventory, KGIS website. NA=not available or not applicable. 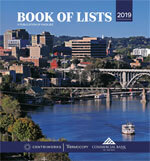 If you notice an error or omission, please contact Angela Akers at 865-342-6424 or lists@knoxvillebiz.com.